Exploring the bonds of motherhood, marriage, and friendship, and narrated by a memorable and endearing character, The Late, Lamented Molly Marx is a hilarious, deeply moving, and thought-provoking novel that is part mystery, part love story, and all heart. 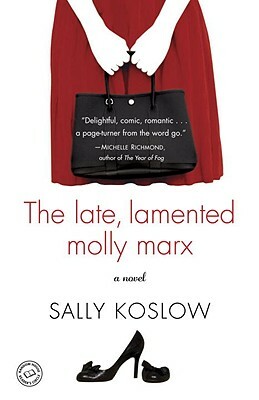 Sally Koslow is the author of the novel Little Pink Slips. Her essays have been published in More, O: The Oprah Magazine, and The New York Observer, among other publications. She was the editor in chief of both McCall’s and Lifetime, was an editor at Mademoiselle and Woman’s Day, and has taught creative writing at the Writing Institute of Sarah Lawrence College. The mother of two sons, she lives in New York City with her husband.